I love the start of a new season- new clothes, fresh ideas, and a change in weather. Spring is such a great season, especially because of the bright colors and trendy pieces. I have purchased some items on this list, so I hopefully will feature them in the upcoming weeks. 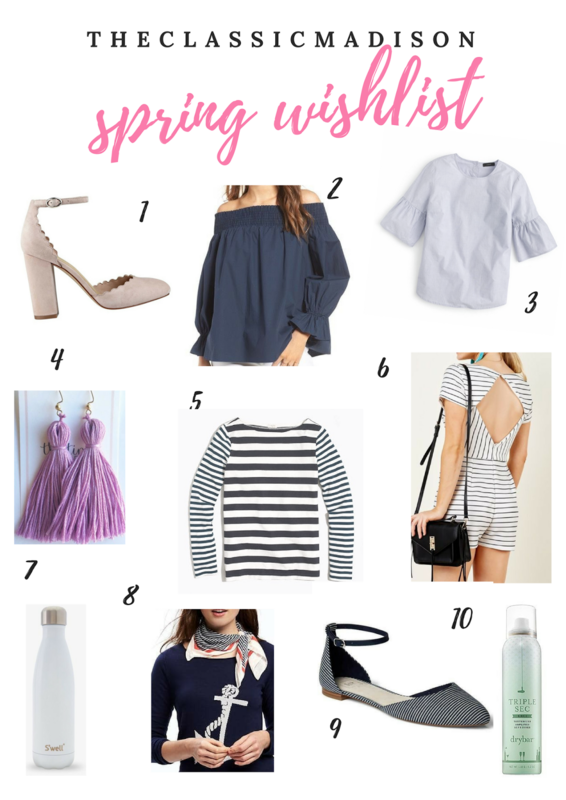 I hope you all can take some inspiration from these items for your spring season! I absolutely love scallops, so when I saw these I immediately had to purchase them. I bought these for prom and graduation events this coming spring. I bought the light pink color because I think it will go greatly with my emerald green prom dress and my white graduation dress. I'll let you all know what I think about these beauties! I originally saw this top on Lonestar Southern and fell in love. The back has a cute bow detail which sealed the deal for me. The only color currently available is white, but honestly this blouse in white would look adorable with pink pants and some Jack Rogers. I also saw this top on a fellow blogger, Richmond Prepster. She styled it with a chunky pearl statement necklace and flats. I love how airy the top looks and it is so fresh and trendy for spring. Tassel earrings are a major trend right now, but I didn't want to spend a ton of money on something that might not last till next spring. I loved the lilac color for spring but also for my college colors (which is so close and I cannot wait!!) I like how these are string instead of beads, so they will be much lighter. You also can't beat the price- 12 dollars! I can't even begin to count how many striped tees I have, but this one is different. The two different shades and thickness of the stripes makes this so nautical and unique. Throw this on with a square silk scarf, and you immediately will look like a Parisian. I saw this on the Red Dress Boutique website, which by the way has some amazing finds at the moment, and I fell in love. The piece looks like a dress in the front but has the short detail in the back. So cute for spring/summer and vacations! With all the craze on the Lilly Pulitzer s'well bottles, I am actually really interested in hopping on the s'well bandwagon. I like this pearly white color because you can add a super cute monogram sticker and make it your own. I ordered this a couple of weeks ago when it was on backorder, and I will hopefully be receiving it in the coming weeks. I love the stripe detail! These scarves are so trendy right now, but are classic pieces that can be worn in the years to come. This one is also a great price! These shoes are so classic. I really hope I can add these to my wardrobe soon! I love how simple they are, yet so sophisticated. I am really sad that I don't have a drybar near me, especially since I just started to find out about it a couple of months ago. However, I have heard great things about this three in one dry shampoo, texture spray, and volume hairspray. I will be picking this up next time I'm in Sephora. 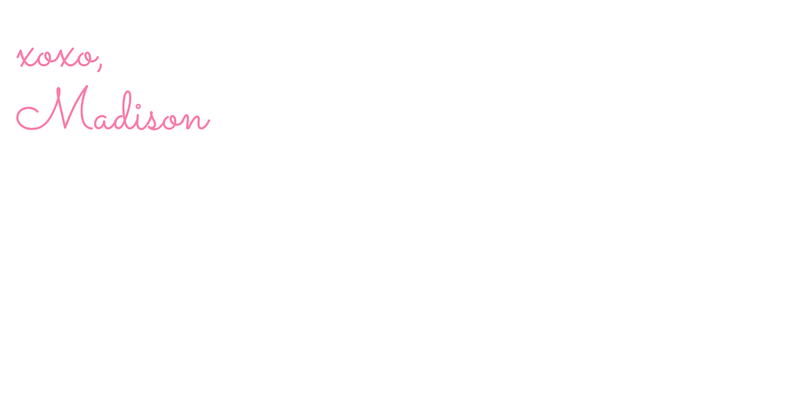 Let me know what y'all thought about my wishlist! Is there anything on here you will be adding to yours too? Enjoy the upcoming warm weather and have a fabulous day! Thanks for reading!